I’m about to start on a jewelry box project for my daughter which includes a tray that is supported & rides on a tray support. 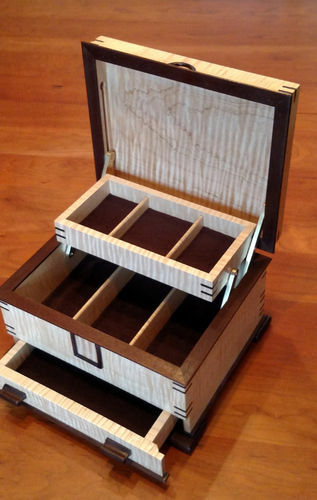 The box will look something like this http://www.rockler.com/jewelry-box-hardware-kit. The tray supports are listed at $79.99 separately and appear to be of good quality, but holy moly they’ll cost more than the walnut wood & making the box itself, plus I’ll still have to get the hinges & lock. The hardware kit lists for $110, which is less than if I were to purchase the components separately, so the kit price is a savings, but still expensive. Now I have to think whether or not I want to disappoint my daughter because I’m not going to spend that amount on hardware. Plus, my wife wants one too. 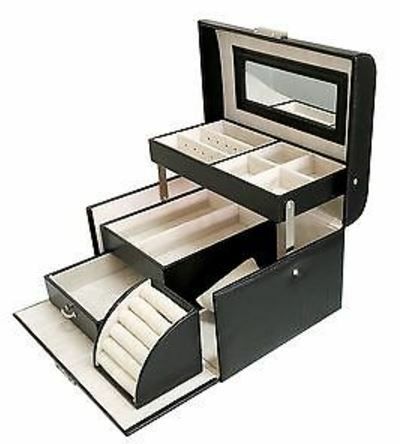 Can any of you suggest a less expensive source for jewelry box hardware that is of decent quality? If you want cheap and high quality and don’t mind putting a fair amount of time into design and building, you can buy some flat brass stock and make your own. It’s even possible to make something using a dense wood. Jewelry box hardware is expensive, but if you search long and hard you can find it cheaper. Rocker typically carries quality hardware, but often times it has a significant price markup. Personally I’d follow JAAune’s advice and roll your own. It’ll take more time, but it will be unique. I had a similar problem with a jewellery box of my own. LV wanted almost $10 for necklace hangers and I needed 6. I turned wooden ones on the lathe and in my opinion they looked just as good. I know hinges are a different story but it’s possible. I must say that using high quality hardware is great though. Try fitting a set of Brasso hinges and then going back to el cheapos. Not much fun. Good luck with whichever way you go. Nice work JAAUNE! Way above my abilities. This project is evolving more than anticipated. 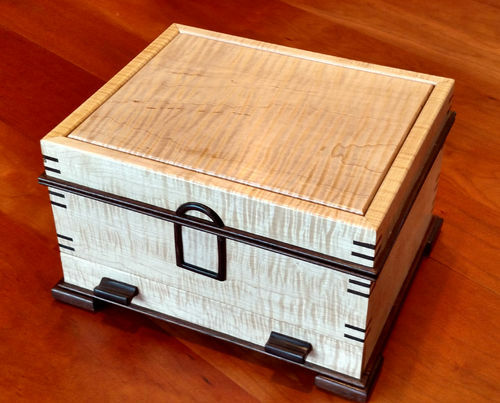 It’s now an elongated 8-sided box with matching tray using more conventional hinges & a lock. My thoughts would be to find a jewelry box on clearance somewhere and rob the hardware off of it. Google jewelry boxes, should be something cheap with the necessary hardware you need. I agree with the make your own school of thought. I have posted pictures of this box before. The tray lift mechanism was made from some brass bar stock I bought from Online Metals. It took a bit of trial and error with a poplar mock up to get things working properly to fine tune the locations for the screws to have the tray lift smoothly, remain level, and for the box to actually close. A real challenge, but it was fun and very satisfying to solve. Here’s a slightly different way to accomplish the same tray effect. This entire box is selling around $30 online. Maybe there’s a way to make this work using basic parts from the Hardware store? Kazooman what a great way to do the same thing easier & perhaps better. The Kiss philosophy sure sings there! Thanks A&C. I couldn’t find what I was looking for, but I saved the site for future reference.